Transitioning from your working life to retirement takes vigilant planning. It takes years of planning and investing to have a steady stream of income so you can enjoy your retirement years. Retirement planning is about managing your money so you can make the most of your retirement years. Your retirement plan should balance your needs, wants and the reality of your finances. Set goals – A plan helps you set goals for retirement, including the age when you want to stop working and your lifestyle. Know how much to save – It can help you figure out how much money you need to save to live comfortably in retirement. Choose what to invest in – A plan can guide your investment choices based on your goals and your risk tolerance. Your age – When you start saving makes a big difference in how much you need to put away. 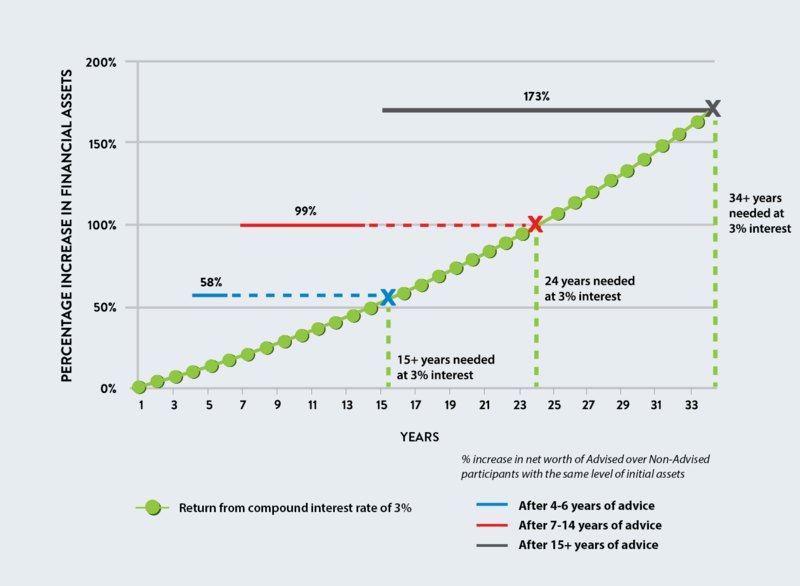 The younger you are when you start, the less money you have to put aside, thanks to the power of compounding. Now, add the help of a financial advisor, and you have the perfect formula for accumulating wealth! Your lifestyle – Do you plan to stay home, travel the world, retire overseas? The amount you’ll need to save will depend on the life you plan to lead when you retire. Federal government benefits & individual pensions – You could be entitled to government retirement benefits like the Canada Pension Plan (CPP), Old Age Security (OAS) and the Guaranteed Income Supplement (GIS). You might also have a pension from your employer that could potentially add to your retirement income. If you’re eligible for income from all these sources, you might not have to save as much. Studies show that investors using a financial advisor, hold higher proportions of on-cash investments, and participate more in tax sheltered plans in comparison to non-advised investors. The chart to the left shows that an investor that receives a steady compound 3% annual rate of return (net of fees), falls substantially short of asset levels observed for the investors that received investment advice and asset allocation. *New Evidence on the Value of Financial Advice, By Dr. Jon Cockerline, Ph.D.